All the posts I've seen on BGG describing the rules of Go have been needlessly complicated. Go is a rules-simple game--you can learn to play in 3 minutes, really! I've added my take on the rules below. For my actual review, scroll down a little ways. 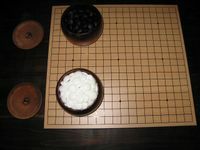 Go is a 2-player abstract game. You can think of the game as a struggle between two cowboys (one black, one white) who want to fence off as much of Wyoming as they can get, using a limitless supply of giant stones as fences. Wyoming is represented as a 19x19 board, which starts empty. Players take turns adding stones of their color to the board. By the end of the game, the board is quite crowded with black and white stones. Any empty space you manage to fence off is all yours. Sometimes empty space can be created by destroying your opponent's stones! 1. Take a stone from your bowl and place it on any empty space on the board. 2. If, by placing your stone, you manage to suffocate group(s) of your opponent's stones, those stones die! Your opponent's suffocated stones are removed from the board. 3. After completing Step 2, look at the board. If any of your own groups are suffocating, you did something wrong! Suicide is illegal you sicko--why would you want to kill your buddies?? So take back your entire move and move somewhere else! You now know every single rule of Go (if you've read the footnote). ** I've left out of my description a few things that are not technically rules but are important concepts to understand (e.g., two eyes, left for dead). You can worry about these things when you actually get to a board. It is common practice to compare Go to Chess, and for good reason. Both games have the reputation of being no-luck, top-of-the-line games for intellectuals. Both games require mental prowess and dedication to play well, and are interesting enough to entice people to put in exceptional effort. And yet, the feelings to the games are very different. As Chess is a well-known game that fosters from both adherents and laypersons a strong reaction (or strong for a boardgame anyways), it is a useful starting point for an introductory discussion of Go. Chess has been described as being a knifefight in a telephone booth; it's a game where killing the enemy would be a lot easier if it weren't for all the limbs packed together and in the way. From the beginning of the game, you have at your disposal 16 pieces, some of which have the potential to travel great distances, and all of which have the potential to kill the opposing king under the correct circumstance. The two heavyweight boxers in the telephone booth are prevented from immediately killing each other only because of logistics. As such, the focus in Chess is strongly on the read-ahead, and one brilliant tactical move is all that's needed to destroy the enemy completely. It makes for a short, "brilliant" game, where the threat of a great bloody stroke is everpresent. If a Chess player can be described as a crafty heavyweight boxer, a Go player can be described as a crafty structural engineer. Let me explain. There is a saying that civil engineers, when designing a 50-yr bridge, try their best to ensure that 1) the bridge will be strong and solid for 50 years, and 2) it falls completely into dust after 50 years and a day. The idea is that, though the bridge should be functional, making any of the bridge's components last longer than any of the other compenents would be a waste of resources. In Go, you are building about 10 bridges at the same time. Some of the bridges are small and unimportant, others have important keystones that need to be protected, and still others are truly visionary, traversing vast, grand spaces. You nervously watch them all and hope that you are building them to be *just* strong enough. At the same time, you are sabotaging your opponent's 10 bridges, trying to force them into small, unimportant spaces, or even better, making them crumble into dust. Playing Go also resembles bridge-building in terms of development. From the beginning of the game, you place broad foundations for your bridges, trying to form stable bases from which you can erect grand structures. You may also plant seeds of instability in your opponent's foundations. By midgame, the general designs of your bridges have become clear, and you work at a more technical level to ensure that all joists are stable, to build out from your stable bases into neutral or enemy territory, to thwart attempts of your opponent to hinder your development, to abandon projects that are hopeless, to cunningly destroy some key sections of your opponent's bridges, and to work out the implications of subtle shifts in the landscape. As the concrete dries, you start feeling more and more secure about your holdings, but you still remain paranoid about everything collapsing! The endgame is a slightly tedious affair--all structures are either clearly stable or clearly dead, and all that is left to do is a final inspection to ensure that there are no loose ends anywhere. Ignore the endgame for now. For the other parts of the game, it's pure fear 90% of the time, "How will I stop the attack? Do I have enough stones here? What if he goes there? How am I going to get out? ", and incredible, "AHA! I GOT YOU!" 10% of the time. All the while, your brain is doing somersaults, trying to read ahead, put a numerical value on a particular move, trying to see the patterns emerging, following or changing your grand strategy. When placing a single stone on a 19x19 grid, you have to consider strategy, tactics, connectivity, survival, destruction, territory. The board is expansive and vast (361 spaces, compared to Chess's 64) and there is an epic feel to the game. There is a certain opaqueness to Chess that frustrates me sometimes--for example, the fact that pieces sitting next to each other do not necessarily have any influence on each other (such as 2 opposing bishops sitting on different colors of the checkboard), whereas pieces on opposite sides of the board may be in direct conflict. The opaqueness is partly what makes chess so fun, so full of, "wow, I didn't see that coming!" Go, in contrast, is intuitive in a way that Chess is not. In Go, a stone placed somewhere in the top right will have an influence on the top right portion of the board. Two stones placed close to each other will be able to support one another. This is especially true in the beginning of the game, when the board is clear and every single stone placed radiates influence over a large area. Even at higher levels of play, opening moves are played largely on a gut level. Novice players can observe an experts' game 10 moves in and understand at a grand level the strategy of both sides. The intuitive opening game is absent in Chess, which instead relies on memorized and practiced openings. Also, pieces in Go, once placed, stay in place for the most part, and reading ahead 20 or so moves is not difficult in some situations. Yet Go is still exciting because there's a strong incentive for players to do *just* what is necessary on each portion of the board, and the risk you take on for any part of the board is of your own volition. Go is also exciting on the tactical level. The intuitiveness I described becomes less so as the game progresses, and there are brillant moves that can be performed in areas where a surgical scalpel is needed to excise the tumor of your opponent's stones from the board, or to carve a passage through enemy territory, or to quickly reinforce a rickety bridge. The least enjoyable period of a Go game, in my opinion, is the endgame, which requires some tedious calculation. With any luck, most games you play will be decided in the middle of the game, and you or your opponent can resign at the climax of the proceedings. But if the game is close, then you and your opponent are required to scramble for the 20 or so small scraps of territory left on the board. The endgame requires scrutinizing the board, determining the size of each particular scrap (each 'scrap' will have an actual numerical worth that can be calculated with a little work) and picking up the pieces in the right order--biggest pieces first, so that your opponent doesn't pick them up first. There is almost no creativity associated with the endgame--like playing that video game 'Dragon's Lair', there is only one 'right way' to do things, and you just have to be careful in executing your moves. It's an anticlimatic way to end what is otherwise a game full of creativity, personality, and emotion. Because of the amount of dedication needed to play well, Chess and Go can be intimidating to new players. However, unlike Chess, Go has a handicap system that allows people of widely different abilities to play exciting games with each other, without seriously affecting the flavor of the game. And just like Chess, Go is fun even for new players, believe it or not! So don't be intimidated--ask your local Go-nut for a game. You'll both enjoy it. 4. If, by making your move, you are making the board look exactly like it looked earlier in the game (i.e., you are repeating a position), you'll have to take back your move and go somewhere else. This keeps the game from stalemating. It may sound like a hassle to keep track of every single position that has ever occured, but in practice it is very easy, as you will see once you play. **When you play, you may find that your experienced opponent plays with rules that sound different. (They may be called 'Japanese' rules.) Just tell your opponent that you know the Chinese rules. Functionally, they are 99.9% identical--the best move in the Japanese ruleset is almost always the best move in the Chinese ruleset. It's beyond the scope of this article to explain why this so. Just ask if you can play by Chinese rules--your oppenent is hopefully kind enough to acquiesce. (Chinese rules are easier in theory to understand, but Japanese rules are easier in practice to count up the scores at the end of a game. Once you get some experience, you will see why they are functionally equivalent). Suggestion to beginners: take two pieces of paper and cover part of the board, so that it's smaller (9x9 or 13x13). ALL beginners should do this--you shouldn't be playing any serious 19x19 games until you've played a good 6 months on the 13x13, getting down all the tactics. And even 13x13 is too big for true beginners. Going straight to 19x19 is like teaching a kid to swim by throwing him in the deep end. Don't think of a small board as being a 'dumbed down version of go.' You'll get all the pleasure of the tactical component of go, and because of the handicap system, you can play people much better than you without feeling self-conscious. All that will be missing is the 'big picture' type thinking that happens on the bigger boards, and a longer playing time. I disagree with Ron Lee's assertion that Go's endgame lacks creativity. I would also suggest that comparing the strategy of a game that has endured for centuries with a flash-in-the-pan video game is superfluous and over simplified at best. However, I think Ron Lee's thoughts on the comparisons of Chess and Go demonstrate an insightful grasp of the strategic territorial conflicts that both games present to players. I was also drawn in by Ron Lee’s interesting bridge building analogy in regards to playing Go stones and the clever metaphor it suggests for the game element many Go players refer to as connectivity. Taking the liberty of continuing Ron Lee’s metaphor, I would offer the opinion that the endgame for Go offers a complexity on par with that of a civil engineer connecting a convoluted system of roads and bridges into a cohesive network while simultaneously dealing with immovable obstacles, changing priorities and the threat of collapsing the whole system if one misses that critical cornerstone. In any game with 100% information, there should be no surprises. There should be no "aha!" moves. If something unexpected happens to you, it is because you are not skillful enough. The term "creativity" can be applied to any phase of the game. In any situation, you can either read 20 moves ahead or you can use intuition. Experts do some of both. The endgame in go--called yose--can be very complex indeed, especially when there are ko fights with a lot of points involved. I would offer the opinion that the endgame for Go offers a complexity on par with that of a civil engineer connecting a convoluted system of roads and bridges into a cohesive network while simultaneously dealing with immovable obstacles, changing priorities and the threat of collapsing the whole system if one misses that critical cornerstone. fair enough. Your description is a good one for the *beginning* of the endgame, which is indeed a period that is often ripe for interesting exchanges, and one I should have discussed in more detail. I liken it to trying to make changes in the structure of things in the hour before the concrete sets. When you can do something interesting, it's often very interesting! I stand by my comments and my "dragon's lair" comparison, though I should have really described the period of the game as "the end of the endgame". If a game is close enough that it boils down to a handful of points, there is generally one optimum way to get the most points, and it can be calculated with some unpleasant work. Ron Lee's clarification that the "end of the end game" in Go can be an exercise in tedium is a more clear point and a point well taken. If the end game just turns into bean counting then I agree that that can be anti-climatic. Thanks for the great "in a nutshell" rules. A terrific analysis of the games of chess and Go with nice analogies. In Go, if the players are appropriately ranked and the proper handicaps given, the game should be decided with a difference of a few stones. Those few stones will be decided in the final moments. Weaker/newer players will have trouble knowing the correct move throughout the game, so will find the endgame just as challenging. Stronger players will be spending less and less time on moves as they become less and less challenging, so the game will end quickly when it needs to. "With any luck" the game and your interest in it are not over until the end. The real challenge in Go is to find regular players with whom you can establish appropriate ranks and handicaps so your games can go the distance. Hi, thanks for your comment! I agree, it's very fun to have a game come down to the wire, but to me, the fun is dampened by a calculational endgame (or, as I clarified in some previous comment, "end of the endgame"). It's rare that the endgame will be won by a brilliant creative move; rather, it's won by careful, accurate calculation. That calculation can be a challange, sometimes even an interesting challenge, but never is it a challenge with a creative solution. And creative solutions are the part of Go that I enjoy the most. I'm very bad with being careful! But in truth, my distaste for it is waning a little, now that I'm starting to see how rich the "counting" problem can be--sometimes it's a tricky maze, and you have to carefully check down each alley to see which alley leads out. I liked mazes when I was a kid. Nice analogy of Go and civil engineering. What I found particularly interesting is the analogy of Chess and "knife-fight in a telephone booth". That description can't be more accurate. One of the things I've noticed more strongly in Chess is how tightly packed everything is, and how little room there is for maneuvers. Have you played Xiangqi? It's very similar to Chess, but much more open and spacious. There are 90 locations as opposed to 64, for the same number of pieces (32). This was another nice read the second time through. I noticed a comment that is accurate within the context in which you use it, but.. In Go, a stone placed somewhere in the top right will have an influence on the top right portion of the board. You were contrasting this to chess where closeness doesn't always count, but across the board influence often does. The across the board influence is also true in Go, as in ladder breakers. The best moves have local as well as whole board influence/meaning. Yeah Jim, because you can really consider every single possible move of your opponent onto one of the 361 spaces on the board each time you make your move and still play in a reasonable time, especially as some moves create consequences that are not immediately obvious. Of course there are going to be moves that suprise you. I suspect that experts more often get suprised by a shockingly bad move than a good one.